I originally set out to look into American and English advertisements for the sale of Constantia wine through 1795, which is just after the first British occupation of the Dutch Cape Colony. I searched for advertisements in the Early American Newspapers Series 2, 1758-1900, the 17th-18th Century Burney Collection Newspapers, and the Virginia Gazette 1736-1780. In the Early American Newspaper collection the sale of Cape wine was first advertised on April 26, 1750 when Commander James Child, of the ship Catherine, listed the wine amongst sundry goods. After Commander Child placed a second advertisement on May 3, 1750, there were no further listings for the sale of Cape wine or Constantia wine through the end of 1796. There are no references to Cape wine and Constantia wine in the Index of the Virginia Gazette. I found no references either in research for my earlier posts The Varieties of Wine Available in Colonial Williamsburg and Wine Names from Colonial Williamsburg. This does not imply that Constantia wine was not sold nor consumed in America during this period, rather it suggests its rarity. I did find advertisements for Constantia wine in English newspapers. They appear even less frequently than the advertisements for Cape wine that are peppered throughout. Thus the rest of this post focuses on these English advertisements. Constantia wine was first advertised for sale on June 11, 1743. This “Small Parcel of genuine red and white Constantia Cape Wine” is described as, “very bright, and of fine Flavour”. It was sold for £1 1s. per gallon including the bottles. This parcel along with red Cape Wine had been recently brought back by the proprietor with enquires handled by Mr. Abbiss in Dolphin Court. On June 22, 1743, another advertisement was placed for these same wines. This time the price was reduced by 1s. to 20s. per gallon or 30s per dozen pint bottles. It is of interest that both the red and white Constantia were sold at the same price. Not all sales or auctions advertised included both Constantia and regular Cape wine. That same month the “Stock in Trade” of the bankrupt Messrs. Pearce and Stedman were advertised for auction. This included “ten Lots of fine Red Cape Wine.” On September 10, 1743 the stock of the bankrupt vintner Mr. Jos. Thorpe was advertised. There was no Constantia listed, despite the diversity of the stock which included old Claret, Champagne, Tent, Cyprus wine, old Rhenish wine, and “Turky Muscadine”. There were “twenty-two Dozen and six Pint Bottles of fine red Cape Wine” and hogshead of white Cape Wine. View of the Cape of Good Hope. Elisha Kirkall after George Lambert. 1734. #2010,7081.2468. The British Museum. A decade passes until Constantia wine next appears in another advertisement. This time by “John Welch, Broker” on April 4, 1754. This advertisement lists “Twenty-five Dozen Pint Bottles of curious white Constantia Cape Wine” and 50 dozen “excellent Red Cape Wine, of the best Growths, and of fine Flavour” amongst others. Samples of the wines were available for purchase or taste. To give a sense of that period “Two Egyptian Mummies, in good Preservation, with a great Number of Hieroglyphicks” were advertised as viewable until sold. The advertisement claimed the male mummy was “SEPTIMIV a Tribune” who served under King Ptolomy in the wars with Julius Caesar, sent by King Ptolomy to assassinate Pompey. The female mummy was “Princess ARSINOE” youngest daughter of King Ptolomy, sister of Cleopatra, killed at Marc Antony’s order by the “Instigation of Cleopatra.” In 1926 the bones of a young woman were excavated in a burial chamber located in the Octagon at Epheus. It is being debated that these are of Princess Arsinoe IV. Still, imagine the day one could have had tasting rare Constantia wine then viewing even rarer mummies. Unfortunately, the full inventory of wine was still advertised for sale on April 8, 1754. Three years later on January 19, 1757, a “SUNDRY excellent Wines” were advertised for sale. Constantia Cape Wine was sold at 18s per gallon. This is equivalent to £1 7s. per dozen As a reference old Cyprus was listed at 14s per gallon, Burgundy £2 14s per dozen, “Latour Lafite and Pontact Claret” at £2 11s per dozen, and “Champaign” at £3 10s per dozen. This places Chateau Latour and Chateau Lafite at almost twice the price as the Constantia wine. For reference Mr. Abbiss, in 1743, sold Constantia at the more expensive price of 20s per gallon or 30s per dozen. A decade passes again until Constantia wine was advertised on May 16, 1767. Six dozen bottles were available for purchase, minimum one dozen, at 10s 6d. per bottle. The advertisement noted, “It is warranted genuine and free from any Mixtures, being still in the Possession of the Person who brought it out of the Cellar at the Constantia Vineyard, where only it is to be had.” At £6 6s. per dozen this represents an almost five-fold increase in price over one decade. Perhaps it commanded such a price because it was genuine Constantia wine. There were only two advertisements in the 1770s. On March 29, 1774 Samuel Paterson advertised the auction of “Sundry Lots” including “rich Cape Constantia Wine, in Bottles.” The wines could be tasted and catalogues were available. On November 15, 1779, Mr. Skinner advertised the auction of seven casks of “Excellent CONSTANTIA WINE”. These were the property of the bankrupt Captain Charles Mears, the late Commander of the Egmont East Indiaman. Shortly before bankruptcy on August 30, 1779 he wrote a letter from Blackheath to the Lords Commissioners of the Admiralty stating that the “Essence of Spruce” had been used to make spruce beer and his men had remained healthy on their voyage. I imagine he drank diversely having been a long-time commander. 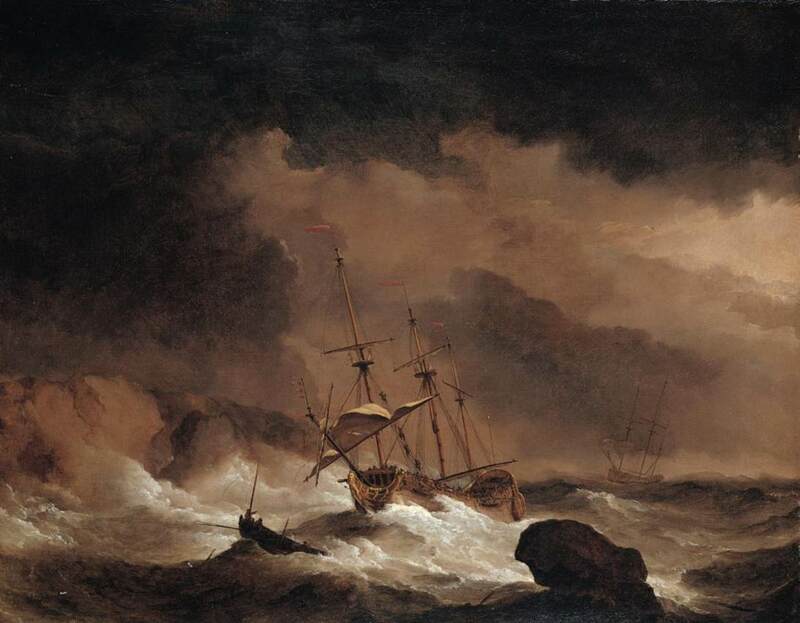 An Indiaman in a Gale off a Rocky Coast. Willem van de Velde, the Younger. Private Collection. Web Gallery of Art. Messrs. Greenwoods advertised for sale on March 7, 1795, a small quantity of Constantia Wine in bottles which were imported in 1789 and 1790. These were the properly of a gentleman who had returned to the East Indies. That same summer on June 15, 1795, Mr. Christie advertised the sale of 38 dozen pint bottles of “Genuine High flavoured CONSTANTIA WINE” the property of an East India Captain. These are the last advertisements for Constantia wine prior to the Battle of Muizenberg. The following year sees the resumption on April 15, 1796, when 120 casks of Red and White Constantia were advertised for auction. 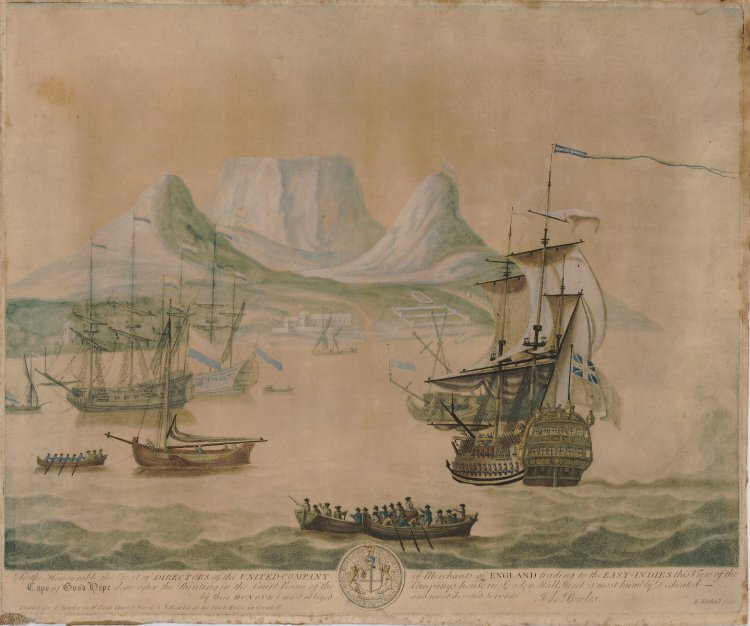 These were the property of Captain Overbreck of the ship Meermids from the Cape of Good Hope. The production of Constantia wine was very small and was purchased almost exclusively by the Dutch East India Company. A very small amount was purchased by private individual. This is reflected in only nine different parcels being advertised for sale in English newspapers between 1743 and 1795. Pennsylvania Gazette, published as The Pennsylvania Gazette; Date: 04-26-1750; Issue: 1115; Page: . Early American Newspapers Series 2, 1758-1900. Pennsylvania Gazette, published as The Pennsylvania Gazette; Date: 05-03-1750; Issue: 1116; Page: . Early American Newspapers Series 2, 1758-1900. Daily Advertiser (London, England), Saturday, June 11, 1743; Issue 3868. 17th-18th Century Burney Collection Newspapers. London Daily Post and General Advertiser (London, England), Wednesday, June 22, 1743; Issue 2705. London Daily Post and General Advertiser (London, England), Wednesday, June 15, 1743; Issue 2699. Daily Advertiser (London, England), Saturday, September 10, 1743; Issue 3946. Daily Advertiser (London, England), Friday, June 1, 1744; Issue 4173. Daily Advertiser (London, England), Thursday, June 7, 1744; Issue 4178. Public Advertiser (London, England), Thursday, April 4, 1754; Issue 6064. Public Advertiser (London, England), Monday, April 8, 1754; Issue 6067. Public Advertiser (London, England), Wednesday, January 19, 1757; Issue 6943. Public Advertiser (London, England), Saturday, May 16, 1767; Issue 11502. Daily Advertiser (London, England), Tuesday, March 29, 1774; Issue 13500. Gazetteer and New Daily Advertiser (London, England), Monday, November 15, 1779; Issue 15 836. Morning Post and Fashionable World (London, England), Saturday, March 7, 1795; Issue 7207. Morning Post and Fashionable World (London, England), Monday, June 15, 1795; Issue 7292. Daily Advertiser (London, England), Friday, April 15, 1796; Issue 21020. Date: Tuesday, January 10, 1792 Paper: Argus (Boston, MA) Page: 4.